There are wearables where function will always trump fashion, and one of these times involves a glove created to make everyday life easier for those with disabilities. According to the World Health Organisation (WHO), around 15% of the world’s population are physically impaired to some degree. In order for those with disabilities to overcome their daily hurdles, assistive technology is playing a significant role in giving back with impressive wearables such as the Exo-Glove Poly. With the objective to assist those with paralysis of the hand, the Exo-Glove Poly is a wearable glove that gives people with hand disabilities the ability to grasp objects that they couldn’t before. Inspired by human fingers, the impressive device is a soft wearable robotic glove made of polymer. Protecting the wearer from injury, the compact, lightweight glove gives the wearer increased usability in comparison to the more bulkier exoskeleton. Designed with comfort in mind, the waterproof wearable was created by Kyu Jin Cho, Director of the Biorobotics Laboratory at Seoul National University in South Korea. The flexible product allows the wearer to be able to perform daily activities, such as grabbing various-shaped objects. 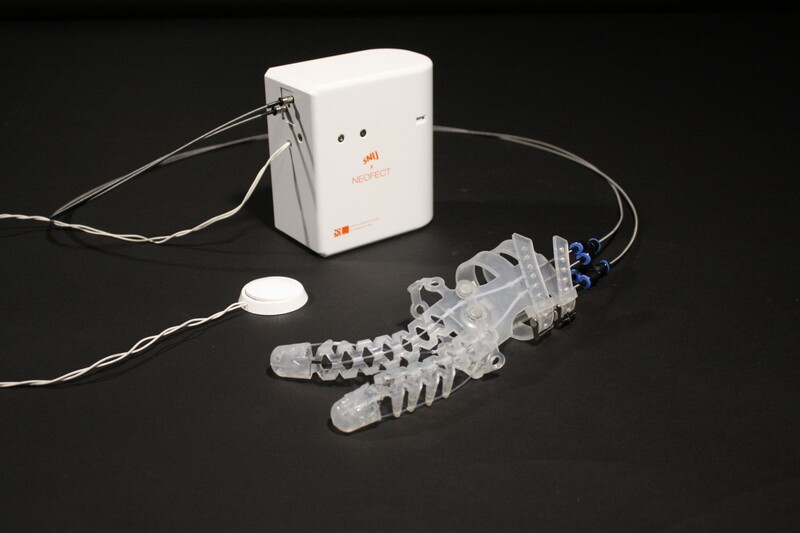 Cho made this possible by including an adaptable grasping mechanism to the robotic hand. Bragging a soft tendon routing system, the Exo-Glove Poly has three fingers that fit over the wearer’s thumb and are controlled by a switch which activates the motor which pulls on wires to open and close the hand. 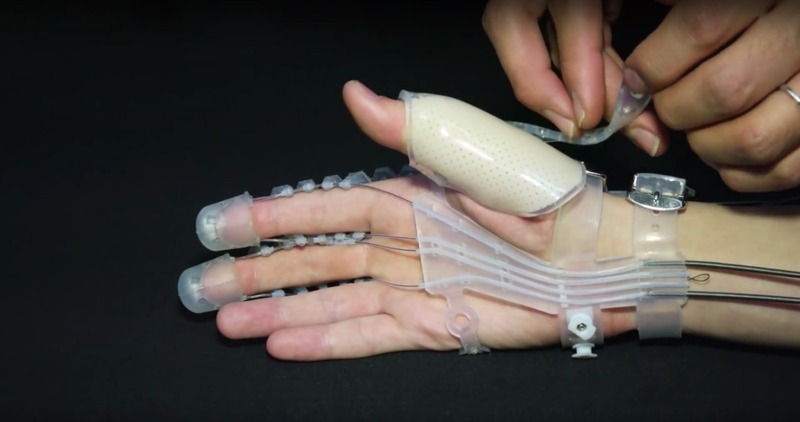 When we first came across the product we were in awe of how the tendons of the robot act just like the tendons of the human body and how the product has the ability to adjust to different hand sizes. Cho is not the first to attempt to create such a device. Previous attempts have been made and the unfortunate thing is that they all shared the same problem of being too complicated to be reproduced at an affordable price. What makes The Exo-Glove Poly different from earlier efforts is that it is a simpler wearable designed on the concept of replacing the previous role of a rigid frame structure with the user’s skeletal structure. Although it overcomes the limitation of the rigid frame wearable robot, the new tendon driven soft wearable robot is not perfect, yet. Before it can be brought to market, they first need to address problems such as fixing the transmission of the robot to the user’s body. This is a problem that they plan to tackle by developing appropriate elemental techniques.